I'm glad you have been enjoying the ideas, etc. I checked out your web page, and there's a couple of quick things that I noted that you could do immediately to bring some more traffic to your quilting business site. The submission instructions for DMOZ are a little bit trickier, but if you put up your site, you can definitely handle it. And the DMOZ.org site feeds a lot of the other search engines, so once you are listed there, you will be picked up by other search engines. Both of these will give you a lot of benefits, including putting you on the virtual map and driving more business your way. 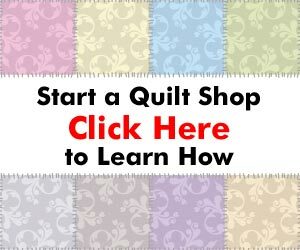 In addition, if you are in to writing about quilting, you could start adding quilting articles to your web site. Search engines love new content, and the more you add, the more of your web site will be indexed by the search engines. You can also submit your quilting articles to a few of the article submission web sites that allow other people to post your article on their web sites as long as they put a link back to your site. The more links you have in to your web site, the higher you will show up in the search engine listings. To find some article submission sites, just go to Google.com and search for “free articles” or “article directory”. I hope this helps. I am working on some books and articles that will help quilters like yourself sell your quilts, so watch your emails for news. Chuck, the other suggestion I would have goes to site design. The pictures, or at least many of the ones I looked at, are over-exposed. The front page is busy and not inviting. Better website design might also be a benefit. I appreciate your answer to the girl who was having trouble selling her crafts, etc. It is excellent. I too will benefit from your informative answers to Betty. Thank you. Another suggestion I would make to Betty is to start exchanging links with other sites, e.g. quilt shops, thread manufacturers, etc. That would improve her rankings with the major search engine sites. Thank you for the link to dmoz.org. I’ve submitted my site to them. Another good site to list your quilts is Etsy. Hi, my comment is, give the people and invitation. invite them to your area to view the quilts to see what they may like to purchase if any an to tell their friends. Hope this will help. have a nice day.